Ottawa, Ontario – The Ottawa Jr. Senators (18-8-2) fall to the Nepean Raiders (9-19-1) 5-4 in a shootout on Wednesday night at the Jim Durrell Sports Complex. The loss to Nepean is the first against them since March of 2017, snapping Ottawa’s nine-game winning streak against the Raiders. The Jr. Senators have now lost two-straight home-games (both in a shootout) and are now 6-1-2 in November. Prior to the game, the Ottawa Jr. Senators organization let Griffin McGregor skate a lap around the ice before everyone entered the sheet for warm-up. During the first period, a special message was aired through the PA about what McGregor did for the organization after he scored the game winning goal in the Bogart Cup. McGregor and Grant Turner were traded to the Nepean Raiders earlier this month for Geoff Dempster. “It’s something we wanted to do as an organization because we like that kid a lot,” said Ottawa Jr. Senators Head Coach Martin Dagenais. “He did a lot of good things for us (Ottawa) and I wish him and (Grant) Turner all the best in their hockey careers. The Ottawa Jr. Senators scored two unanswered goals 20-seconds apart early in the third period to take a 4-3 lead. Owen Cole split the defense to tie the game and Ethan Manderville’s redirection put Ottawa up for the first time in the game. With four-minutes to go in the third, Josh Shimizu won a footrace to the puck and got his second of the game – beating Francis Boisvert with his backhand, forcing extra-time (4-4). “It’s Just Belanger, no urgency like usual,” said Martin Dagenais on the tying goal. “Bisson was on the ice with him and he has to recognize that he’s not an option for a pass. It’s a 50/50 battle, get in there and help him out. Instead he just moved to the side and tried to be an option. It’s the same mistakes over and over and they don’t learn,” added Dagenais. Matt McQuade scored the shootout winner to extend the Raiders winning streak to two-games. The Jr. Senators also go to 1-2 in shootouts this year. The Jr. Senators are back in action on Friday night as they travel to Smiths Falls for a meeting with the Bears. 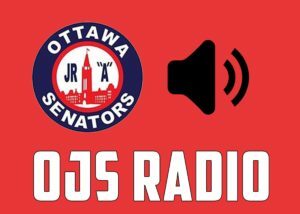 Mason Detre will have the call on mixlr.com/ojsradio.